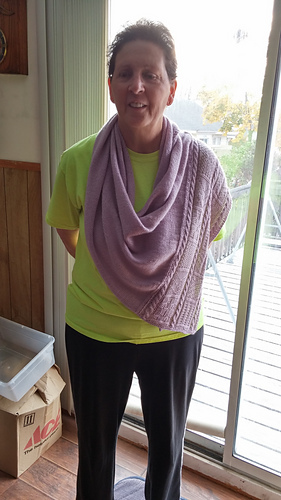 Add any five self-published patterns from my Ravelry Store to your shopping cart and the least expensive one is free. Ganz is available in knitCompanion. 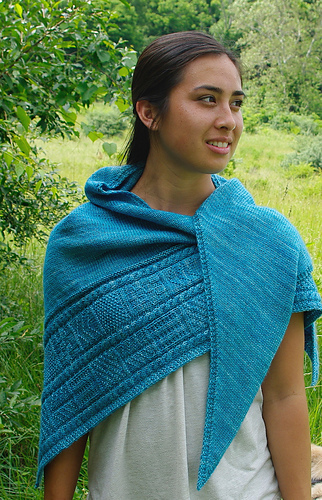 Ganz is a slightly asymmetrical triangular shawl that begins with a cable and gansey panel. Stitches are picked up on the long side of the panel to work the stockinette stitch body. Easy two over two cables can be worked without a cable needle. Once the panel is done, the rest of the shawl is fairly mindless knitting. Ganz is not for a rank beginner, but if you can knit and purl, cable and pick up stitches along a slipped stitch edge, this will be easy for you. Please note that a solid colored yarn will show the gansey panel to its best advantage. 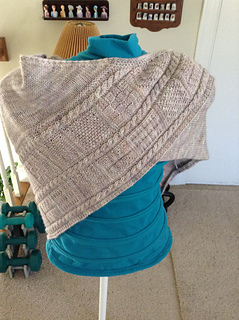 Ganz is pictured here in the colors Plunge and Winter Wheat. 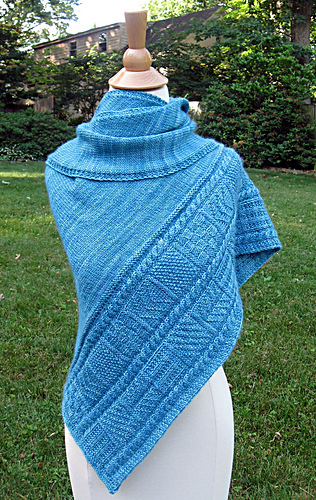 Plunge is a gorgeous blue and a difficult color to photograph. The first picture represents the color most accurately. 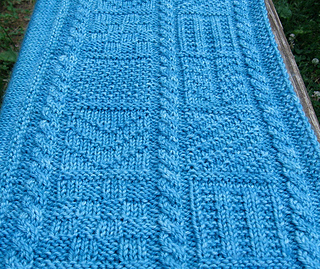 23 stitches/32 rows = 4”/10cm in stockinette stitch after blocking. 360 yards per skein, 2 skeins. Actual yardage used is approximately 720 yards. • US size 6/4.0 mm circular needles at 40”/100cm long.